Pocahontas is an adventurous soul who thrives on nature and has a strong spiritual connection with the Earth. Although she only wears one outfit during the film, she is still a great source of fashion inspiration. So, for this installment of our Disney-Inspired Fashion series, rather than focusing only on the character’s clothes, I decided to get a little more creative and draw inspiration from her environment and from the songs in the movie as well. For more Disney-inspired looks, check out our past articles on Walt Disney’s Snow White, Walt Disney’s Sleeping Beauty, Walt Disney’s The Little Mermaid, Walt Disney’s Cinderella, Walt Disney’s Princess Jasmine, and Walt Disney’s Princess Tiana. Pocahontas is the daughter of a Native American Chief. She thrives on adventure, but is also very wise, spiritual, and in touch with nature. Early in the film, Kocoum, one of her tribe’s greatest warriors, proposes to Pocahontas. 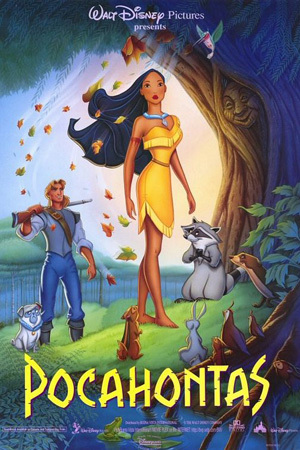 Although she knows this is an honor, Pocahontas does not believe it is her destiny to marry Kocoum. One day, Europeans, including Captain John Smith, arrive in America in search of gold. Although her tribe knows the dangers of Europeans, Pocahontas is naturally curious and ends up meeting John. They communicate with each other, and Pocahontas teaches him that her people are not savages, as the Europeans believe. Pocahontas and John Smith have many secret meetings, talking about their lives and cultures. Pocahontas even takes him to meet her spiritual guide, a tree named Grandmother Willow. Eventually, they fall in love. One unfortunate evening, Kocoum catches Pocahontas kissing John Smith. 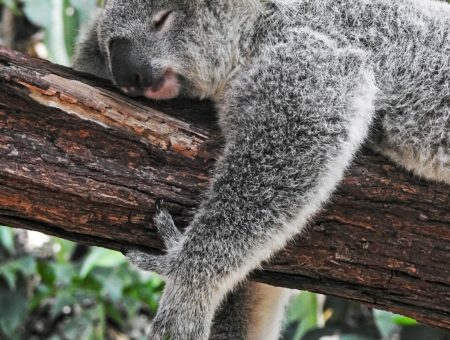 Before he can attack, one of John’s friends shoots and kills Kocoum. John Smith takes the blame for it, and is taken prisoner by Pocahontas’s tribe and sentenced to death. Pocahontas realizes that the execution will cause a war between her tribe and the Europeans, so she throws herself in front of John Smith right as her father is about to kill him. Her father then comes to his senses and does not murder John Smith. The cruel Governor Ratcliffe shoots at the Chief, but John Smith dives in front of him and takes the bullet. Because of his injury, John Smith must return to England. He begs his love, Pocahontas, to accompany him, but she makes the heart-wrenching decision to stay. She believes her calling is to stay with her people, because they need her. The two kiss goodbye, and she tells him that even when they are apart, she will always be with him. 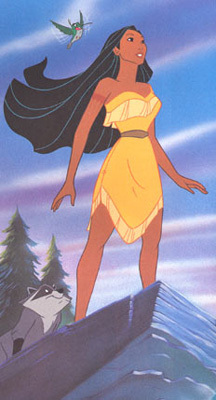 Throughout the film, Pocahontas wears a one-shouldered dress with a belted waist. To translate her dress into the modern day look below, I used mostly neutral colors, but looked for texture and pattern to make the outfit wearable and interesting. I also added a pop of red with the earrings, reminiscent of Pocahontas’s red arm tattoo. After Kocoum’s proposal, Pocahontas wears her mother’s turquoise necklace to symbolize their engagement. To channel this look, I made an outfit with a one shoulder dress, which is similar in style to Pocahontas’s dress. I used a skinny belt to emphasize the waist, and added a turquoise necklace to pay homage to her necklace in the film. Finally, I chose leaf earrings to symbolize Pocahontas’s connection with nature and her spiritual guide, Grandmother Willow. 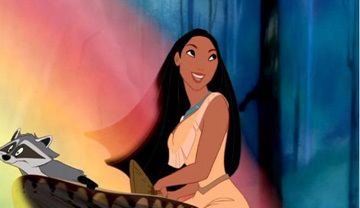 Although Pocahontas is mostly portrayed as a serious person, the song “Just Around the Riverbend” shows her fun, spunky side. To capture the essence of the song, I created an outfit around a brightly-colored dress with a tribal-inspired pattern. To add interest and light, I then added shiny accessories with gold details. I finished this look off with a tan bag, which reminds me of Pocahontas’s dress. 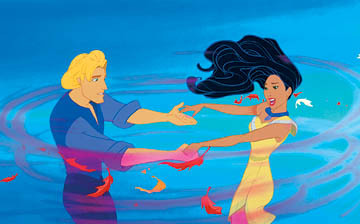 Pocahontas sings “Colors Of The Wind” to explain to John how every part of nature is important and spiritual. This is one of the most colorful and epic scenes in the film, featuring autumn-hued leaves, twinkling stars, and a cloud of prismatic butterflies. To channel the energy from this scene into an outfit, I used a long, colorful maxi dress and some adorable wolf earrings, both inspired by nature. I finished the look off with a wooden bangle, some pretty sandals, and a fringed bag that will move with the wind. Are you inspired by Pocahontas? Which Disney characters would you be interested in seeing posts about in the future? I want to know what you think, so be sure to leave your thoughts in a comment!